When I'm not playing Griselma, I often play Imani. I've sunk many hours into Gigantic's sniper to not only get to grips with her, but to get to the bottom of her playstyle and strengths. As it currently stands she's a popular Hero but she's also considered niche by the majority of experienced players due to her limitations in comparison to the likes of Voden. Despite that, she can still be strong but she needs a skilled player to utilize her effectively. I will also stress that if you're seeking to play Imani purely as a camping sniper, you really shouldn't. Imani might have the ability to scope with her rifle, but she's so much stronger when she's constantly moving locations. That isn't to say you shouldn't utilize her range, but if you just want to sit at the back in one position sniping away you're doing your team a huge disservice. Her Frost Bolt is "meh"
This section of our guide contains a list of Imani skills, what they do, which upgrades you should choose (and when) as well as what those upgrades are for. Autobolts allows Imani to fire off a series of Bolts at an enemy in front of her. It's highly inaccurate and the spread of bolts means that you need to be particularly close to enemies if you want all of them to hit. If any miss, Autobolts hits for much less. As a result, it's actually a liability of a skill if you're expecting to be able to go toe to toe with another Hero 1 on 1. You're best only using Autobolts against creatures or once you've upgraded them. Cycle Ammo is Imani's primary skill that allows her to use Boom Bolts that directly boost her damage or Frost Bolts which slow enemies. You access Boom Bolts by pressing Q once and Frost Bolts by pressing it twice. Until you settle on a bolt choice for a few seconds you can continue to cycle your ammo. I'd always recommend you use Boom Bolts unless you see an assassin running towards you, at which point Frost Bolts are great for defensive use. Silent Scope allows Imani to look down the sight of her crossbow. The longer you stay zoomed in, the more damage you will deal. Be aware however that when scoped, you'll be incredibly vulnerable as your sight is very limited. If you're busy trying to snipe away, there's every chance an assassin is working his way towards you. When the term "quick scope" is used, it's in reference to only using the Silent Scope skill for base damage modifier, as opposed to the x2 and x3 modifier you get when sniping for longer. Your primary defensive skill and one that you can use on allies. When used Smoke Bomb will first from Imani's crossbow and erupt a cloud. Anyone in it will be stealthed and enemies caught in it will be weakened. Be aware that if an assassin does attack you, firing the Smoke Bomb takes 1.5 seconds to fire and land, meaning you'll likely be dead before it even goes off. Use it early. Kill Shot allows you to fire a single shot at an enemy for huge damage. You can cancel the zoom at any time if your positioning isn't quite right. What I will stress is try to only ever use Kill Shot when an enemy is just below half health and aim for squishy targets. Usually it's enough to kill them instantly. 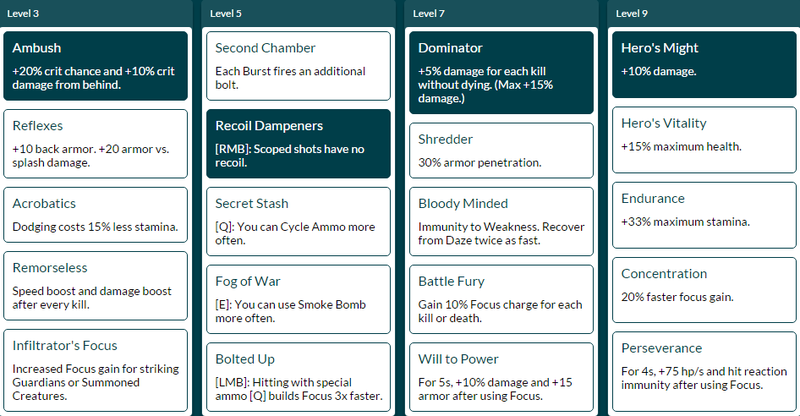 Below is the upgrade path I would recommend for each skill. It's incredibly important as Imani that you follow this path as it provides you with much needed survivability instantly, allowing you to survive for long periods early game. This allows you to quickly gain experience so that you can then ramp up your power. View the full build here. Hit and Run allows Imani to gain a speed boost every time she hits an enemy for a maximum speed boost of 10%. Although her Autobolts don't deal large amounts of damage, it's primarily used for kiting enemies who are trying to kill you, when you've no means of using your Silent Scope. Stopping Power allows you to further defend yourself as your Autobolts will then provide a small knockback when you equip a special ammo (Q). Adjustable Scope allows Imani to charge her Scope to deal x3 damage, instead of x2. It's a huge boost to her damage output and allows her to deal some of the highest single target damage in the game. On the Mark allows Imani to fire her next shot, starting at x2 damage if she lands a x3 damage shot. It effectively reduces the downtime between x1 and x3 damage and as a result, allows you to deal higher damage more often. Die in a Fire elongates the burning duration from Boom Bolts by two seconds, providing a nice little damage boost. All In reduces your Boom Bolt limit by 1 and knocks back enemies you hit. Part of the reason as to why this is so good is the fact that when you do knock someone back, not only do they take burn damage but it also buys you time to line up a second shot that starts at x2 damage. Acrobatics is a must for Imani because Smoke Bomb as a projectile just doesn't give you enough survivability. By pressing Jump + E you'll fire your Smoke Bomb at your feet, allowing you to stealth but also blasting you forwards. As the first upgrade the distance and stealth duration isn't huge, but it is enough to keep you alive during early game. When you take Time to Bounce the range of the blast is improved and the stealth lasts 2 seconds longer. Your escapes are almost always guaranteed. Just remember to jump then press E.
In The Zone allows Imani to gain a 100% critical hit chance on her next shot. If you can land In The Zone, your next Silent Scope at x3 will deal enormous damage. When behind an enemy, Ambush provides +20% critical hit chance and +10% critical hit damage. A lot of the time you'll hit enemies from behind as Imani so it's a huge boost to your potential damage output. Recoil Dampeners removes all kick-back from firing your sniper rifle, meaning you can continue to fire without any disruption to your aim. It's a must. If played right, it's hard to die as Imani. Taking Dominator provides a 15% increase to your damage that you can maintain for an entire match. Building on Dominator, Hero's Might adds a further 10% damage bonus to Imani and if you have 3 stacks of Dominator, you'll be roaming around with a 25% damage increase. This section of our guide contains a list of tactics for fighting against other Hero's with Imani. Please note that only the Heroes that are the highest risk and threat to Imani are included in this list. Charnok's burning combined with his Hot Hail can be a problem for Imani because you can quickly die if slowed in it, or if you take too many hits to the face. Remember that your range is greater than Charnok's and you can fire quicker than he can charge his Heat Wave. If you can hit him early with Boom Bolt, he'll more than likely retreat. HK 206 versus Imani is fairly easy because you're quicker and can pressure easier. Just be aware of his Mortar and Rail Gun. Fortunately you can escape HK-206 easily because he's ranged and you can fire further. If you can, just hit him as early as possible with Boom Bolt and repeat the process of ducking in and out against his fire. Lord Knossos is only a threat if he gets near - if he does, you're likely to die if you don't have Smoke Bomb. From afar, try to keep him slowed with Frost Bolt. If he shows no sign of turning your way, just use Boom Bolt instead. Remember to avoid his Chuck as it can hurt. The Margrave is tough on the basis that he can withstand so much punishment. If he gets close to you, he'll interrupt and deal high damage. From afar, he can do nothing but deflect your shots for a brief period. Just wait it out and then load your Boom Bolts. I can't stress enough that if there's a Tripp on the opposing team, save your stamina, save your Smoke Bomb and always keep an eye out for her. If she's coming to you, try to Frost Bolt her early and Smoke bomb even earlier. If she gets anywhere near you and interrupts your Smoke Bomb, you're dead. Tyto The Swift has the very same principals as Tyto. Frost Bolt him early, save your stamina and Smoke Bomb and just run. You cannot beat a good Tyto 1 on 1, so save yourself and Jump + Smoke Bomb away. Voden is incredibly annoying because of his heal, his decoy and his poison. Having said that, he cannot outlast two Burning Bolts unless he runs, hides and heals. When he does return, it's common that you have Cycle Ammo ready to hit him once more. Just be cautious if struck with his poison arrows because your health can quickly vanish. I'll state that if caught in Wu's Tongue Lash, you will die. There's no counter play, you can't dodge out of his crowd control after Tongue Lash and your Smoke Bomb has a too longer cast time to escape. If you see him coming, run. If he's at a distance, keep him slowed so your allies can pin him down. If he's by himself, hit him with Boom Bolts. Xenobia is only a threat if she gets near. Her slow, burning, armor break and knockback can often be enough to kill you before you've even used Smoke Bomb. If you can, keep hitting her with Boom Bolt from afar so that she has to retreat. If she isn't near her allies, your team is much stronger due to her debuffs being missing. This section of our guide contains a list of tips and tricks we think will help your Imani play. We'll continue to add to the list as required and if you have any tips you'd like to share, let us know in the comments below and we'll place them here. 1. Remember to use your Cycle Ammo based on context. Boom Bolts are for maximum damage, Frost Bolts are great for defensive measures if someone is chasing one of your team or coming for you. 2. The burning on Boom Bolt when upgraded is incredible at keeping high pressure on enemies even if they move out of your sight. If you can, try to keep pressure on squishy targets. 3. Don't just sit at the back firing shots. Your team will be at a disadvantage because your line of sight will be limited, and you'll also be very vulnerable when constantly looking down the scope. Imagine Imani as a guerrilla fighter rather than a sniper who sits in one position constantly. Don't stay in one place too long! 4. Always jump before using Smoke Bomb when it has been upgraded. The leap is fundamental in allowing you to survive. 5. When you're under attack from an assassin, a good way of confusing the enemy is to run one way, quickly turn > jump > smoke bomb and fly in an opposite direction. It's confusing, you're stealthed and can usually escape. 6. You have to preserve your stamina as Imani. You'll regularly be chased by assassins and you need it to run away from them once you land after using Smoke Bomb. 7. When creeping forwards with your team, use Autobolts rather than your scope. You can freely move, aim where you wish and still have maximum vision. 8. Try to maximize the use of quick scoping by using RMB, firing, and moving. There's no need to constantly sit looking down a scope when you can confuse the enemy with your movement and location. 9. Try to save Kill Shot for low health targets. If you don't, those hit will likely run away and they'll be free to regenerate health. 10. I cannot stress enough how vulnerable Imani is to assassins. If you see one coming, use Frost Bolt if you have the time and use Smoke Bomb to escape early. Reposition yourself and then get back into the fight. Ten Ton Hammer would like to thank GGUnleashed for their awesome GiganticSkill Calculator!